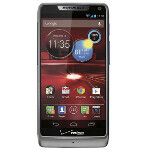 Best Buy is now selling an exclusive Platinum color of the Motorola DROID RAZR M that also comes with blue and grey highlights. The 4.3 inch handset offers an edge-to-edge screen and if you turn the unit onto its side, you can see the blue and gray accents on the buttons. The phone will cost you $49.99 with a signed two year contract, or $599.99 with the device unactivated and of course, runs over the Verizon network if you buy it on contract. 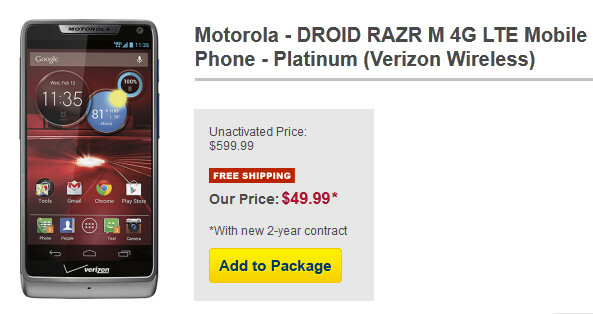 The Motorola DROID RAZR M is a mid-range device that will ship in 3 to 5 business days, which means that supply and demand are pretty much in equal balance. Don't forget that this device ships with Android 4.1 on board which means Project Butter keeps everything running with no lag, as smooth as butter (hah!). Meanwhile, voice activated personal assistant Google Now gives you all of the traffic information and directions you need when you need it. It's a great price for a feature-rich handset, and if you order it from Best Buy now, you can get that exclusive platinum color to show off in front of everyone. Been suprisingly happy with this device. Good job Motorola. I own the RAZR m, I can't Praise this phone enough it is amazing!